Why would you assume that people with the ability to constantly interrupt government workers mid-day, and with the ability to camp out in a park for months at a time, wouldn’t have jobs? 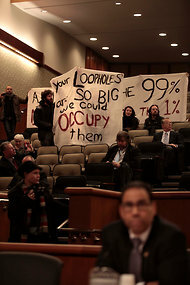 Occupy Albany got their much needed dose of media attention (video below) this morning when they interrupted budget talks in the capital. The attention-whoring featured the usual slapstick, including mic checks and the repetition of short phrases (because saying it twice makes it seem more intelligent), but the interview after the incident was where the real entertainment came through. When asked about the interruption and the tactics used by Occupy Albany, Senator John DeFrancisco, Chair of the Senate Finance Committee, who hosted the joint legislative hearing, says their message was lost on him. “It got my attention so far as it disrupted the proceeding but as far as changing my point of view, no,” said DeFrancisco. Senator DeFrancisco said he thinks New York’s tax code is progressive, with reforms voted in late last year that tax the highest earners, saying Occupiers have a misplaced agenda. “Well, probably get a job would be a good idea and then become one of taxpayers so we won’t have to rely on fewer and fewer people to pay taxes. Farrell is described as a freelance writer in the Legislative Gazette, and has been identified as the author of the book, Liberty for the Lion Shield. The publisher of that book was Xulon Press, a company that was purchased in 2006 by Salem Communications. Salem is the fifth largest radio station owner in the United States, and reported earnings of $207 million in 2010. Glad she’s vehemently opposed to corporate wealth.